Electrical Muscle Stimulation speeds healing time by flushing out inflammation which causes pain. It also helps to break unwanted fibrotic tissue, allowing injured muscles to heal more completely. You will notice an immediate pain reduction through the stimulation of the nerve fibers, which distracts them from the pain. Ultrasound is the application of sound waves above human hearing to tissue to increase healing in an area. 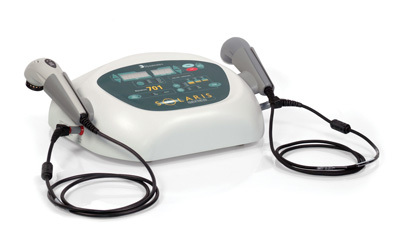 Ultrasound that is applied to an injured area provides a "micromassage", or a vibration at the cellular level. This treatment decreases pain, increases flexibility, and speeds the healing process. Ultrasound may also cause mild heating to occur in the area, depending on how it is applied. Like exercise, each treatment of ultrasound builds on the previous session, so more than one treatment is necessary to gain the effects; usually 5 to 8 treatments are used at the minimum. Your treatment will last from 1 to 8 minutes, and you will need to be treated either daily or every other day. On occasion more extensive ultrasound treatments may be recommended, up to 4 to 6 weeks. When properly applied, ultrasound will cause almost no sensation at all, although a mild warmth may be felt on the skin and sometimes deeper in the tissue. If at any time during the treatment you feel a burning or aching sensation, let you clinician know immediately; the intensity of the treatment may be more than it should. When the body has altered function due to an injury or repetitive stress the cells are damaged and fail to function within normal parameters. 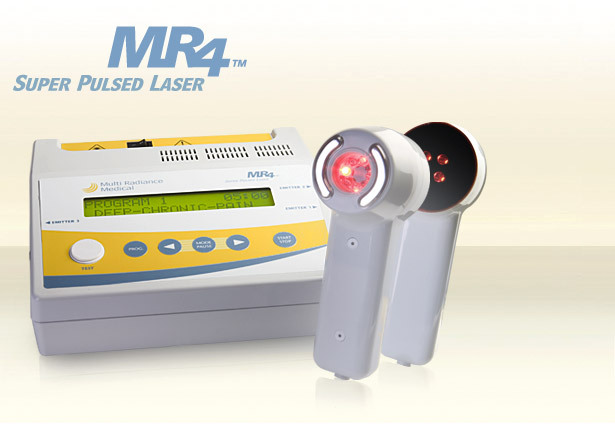 LLLT and low level lasers penetrate deeply into the skin and work by restoring this abnormal cellular function. Physiologic effects include improved metabolism, circulation and tissue healing. Moist Heat is very relaxing to the body. It promotes healing through increased circulation. Heat application helps relax tight muscles, and increases blood flow and nutrition to the area, which can help speed healing once the initial inflammation has subsided. It also helps the muscles and tendons respond better to being stretched and exercised. This treatment should feel like a gentle warmth, never hot or burning. Home Application: If you use heat application at home, a treatment time of 20 minutes (no longer) is recommended. Leave the heat off for an hour or so between treatments. NEVER use any kind of heat on a new (within 3 days) injury. Although the heat will probably feel good at the time, it actually slows the healing process and may cause increased aching and pain a few hours after treatment. For the first 2 to 3 days after an injury, ice is a better choice. Therapeutic Massage doesn't just feel good. It reduces the heart rate and blood pressure, improves functioning of the blood circulation and lymph flow, improves range of motion, improves the muscular, skeletal and nervous systems and may improve the rate at which the body recovers from injury and illness. For more information please refer to the Massage section of this website. Microcurrent enhances the healing process by restoring homeostasis - the body's natural ability to maintain an optimal internal balance. When something happens to affect the body's normal homeostasis adverse symptoms appear, as the body tries to defend its weakest areas and restore balance. Microcurrent Electrical Treatment (MET) acts as a catalyst. It triggers and maintains the numerous physiological reactions which occur in the cell during the recovery process. Homeostasis is the body's natural ability to maintain an optimal internal balance. When something happens to affect the body's normal homeostasis adverse symptoms appear, as the body tries to defend its weakest areas and restore balance. Who can be treated with MET? Patients whose symptoms are not relieved by appropriate drug therapy and /or Patients who are unable or unwilling to undergo surgery or take anti-inflammatory drugs for, amongst other conditions, Rheumatoid arthritis, osteoarthritis and related bone and joint diseases. It also offers relief to patients with sports injuries and to those who are recovering from surgery. ATP (adenosine triphosphate) is known as the cell's energy currency. It works as a carrier of energy in all living organisms. ATP captures the chemical energy released by the combustion of nutrients and transfers it to reactions that require energy: the building up of cell components, muscle contraction, transmission of nerve messages and many other functions. Any healing process consumes a great deal of ATP and may be accelerated through a means of increasing ATP in the tissue. Microcurrent stimulation (MET and CES) to the body causes radically increased production of ATP levels, allowing the body to perform the healing process in an accelerated fashion. Microcurrent therapy is the modality of choice for increased tissue healing. Research and clinical trials have shown that with microcurrent stimulation, there is reduction, healing, improvement or even permanent relief from a variety of medical conditions. In theory our bodies can produce all the ATP we need, in reality they don't. Microcurrent stimulation supercharges the tissue with ATP, which resides there until needed. A controlled modified and weak current (such as the ones used by Elexoma MedicTM) stimulates the production of ATP. This in turn causes a chain reaction of chemical activity which result in analgesic, anti-inflammatory and healing effect on the affected body tissue. Microcurrent is unique in that it has a cumulative effect, rather than a diminishing effect, unlike other forms of electric therapy/electric stimulation devices (interferential, higher amperage TENS and galvanic) that decrease ATP levels. Trauma affects the electrical potential of damaged cells and an injured area has a higher electrical resistance than the surrounding tissue. This decreases electrical conductivity through the injured area, and decreases cellular capacitance, leading to inflammation and impairment of the healing process. What effect does microcurrent therapy have on injured or traumatized cell tissue? When microcurrent therapy is applied to injured tissue, resistance is reduced and the natural current flow of the tissue is supported. This allows the cells in the traumatized area to regain capacitance (flow of electrons) and re-establish homeostasis.